Today in forex trading the NZD/JPY had a sell trading signal on The Forex Heartmap®. This pair and all of the other Japanese Yen (JPY) pairs has very strong sell offs. The NZD/JPY is at one support level so we would scale out lots on any sells. The AUD/JPY also sold off strong and should continue lower after a consolidation period, it is in a strong down trend. The forex market and JPY pairs in particular had many very strong movements today on other pairs and currency groups. The trading signals you see below for the JPY pairs are from The Forex Heatmap®, which also monitors a total of 8 currencies in real time. Today The Forex Heatmap® signaled consistent JPY (Japanese Yen) strength in the market. The GBP/JPY dropped strong to the downside, this pair is trending down on the D1 time frame and should continue lower at least one more day to the next major support. The EUR/JPY has dropped to one support level and we would be scaling out lots and managing profits at the current price levels. The Forex Heatmap®, shown below, provides live trading signals for 28 pairs. Today in forex trading the The Forex Heatmap® visual alert system showed that the JPY (Japanese Yen) strength was evident on all pairs. The EUR (Euro) and CHF (Swiss Franc) were also weak. This drove the EUR/JPY and CHF/JPY lower. The EUR/JPY is in a strong down trend and should continue lower. The CHF/JPY is still trending down on the D1 time frame and we would scale out lots on this sell trade as the ultimate support target is not known. The alert system you sell below is The Forex Heatmap®, it provides visual alerts for eight currency groups and 28 pairs total, in real time. Today in currency trading the Japanese Yen (JPY) strength was evident on all pairs. There was also clear GBP (British Pound) weakness. The GBP/JPY sold off and this pair is trending down on the D1 time frame. This pair should continue lower for at least one more day, but the overall trend on the largest time frames is still up so we would scale out lots at this price level. This pair will likely stall at support and reverse back to the upside in a day or two. The live currency strength signal you see below is from The Forex Heatmap®, which gives currency strength signals for 8 currencies and 28 pairs for traders. Today in forex trading the GBP/JPY had a sell signal on The Forex Heatmap®. The British Pound (GBP) was weak on all pairs, and the Japanese Yen (JPY) was strong on all pairs, driving price movement for forex traders. The GBP/JPY sold off, but this pair is at one support level so we would scale some out lots on this pair at these price levels. The GBP/USD broke one support level on the GBP weakness and is trending down on the larger time frames, this pair is a hold. The trade signals you see below are from The Forex Heatmap®, which provides live signals for 28 pairs, it is a visual map of the forex market. Today in forex trading the GBP/JPY had a sell signal on The Forex Heatmap®. The Japanese Yen (JPY) was strong on all pairs, generating some strong downward movement on these pairs. 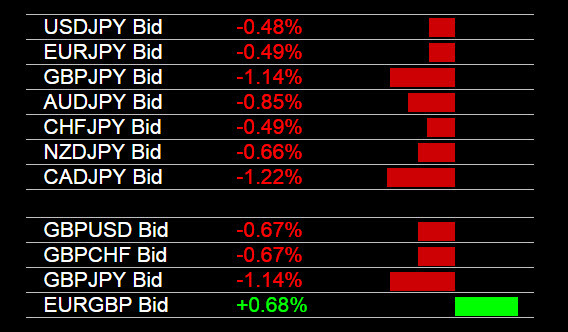 There was also some CAD and GBP weakness in the market. This drove the GBP/JPY and the CAD/JPY down. Both of these pairs are hitting some support levels, so we would consider scaling out lots or exiting these sells. Both pairs should reverse back up as soon as tomorrow and the overall trend on both pairs is up. Today’s down cycles were short term sells against the trend. The sell signals you see below are live buy and sell signals from The Forex Heatmap®. 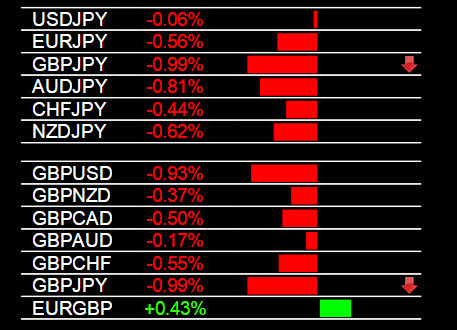 The heatmap gives live buy and sell signals for the JPY and GBP pairs as well as 6 other currency groups. Today in forex trading the GBP/JPY had a sell signal on The Forex Heatmap®. The British Pound (GBP) was weak and the Japanese Yen was mostly strong. Pairs like the GBP/JPY and GBP/USD sold off hard on the GBP weakness. The GBP/USD is not trending down so this is a short term trade and we would consider exiting all lots trades. The GBP/JPY is in an overall uptrend, so once again this would be a short term sell against the trend, it will eventually reverse back up. 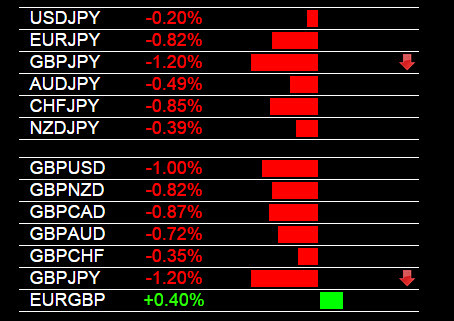 Other pairs like the EUR/JPY and CHF/JPY sold off as the JPY was strong on all pairs. The trading signals you see below are from The Forex Heatmap®, which is a live visual map of the forex market. Today in forex trading the NZD/JPY had a sell signal on The Forex Heatmap® in the main forex trading session. This Japanese Yen (JPY) was strong all pairs and this drove the downward movement on this pair. This pair is trending down on the D1 time frame, and we expect it to continue down to the 86.00 area support level. You can take profit as it approaches this support level. The trade signal system you see below is The Forex Heatmap®, which provides live buy and sell signals for 28 pairs. Today in forex trading The Forex Heatmap® signaled and alert on the JPY (Japanese Yen) pairs. The JPY strength was consistent on all pairs. The NZD/JPY sold off and could continue down the the next support level around the 85.00 price level. The GBP/JPY also dropped but this looks like a short term intra-day trade into some support, so we would scale out lots or exit this trade for money management. The visual trading alerts you see below are from The Forex Heatmap®, which provides visual trading alerts for 28 forex pairs.